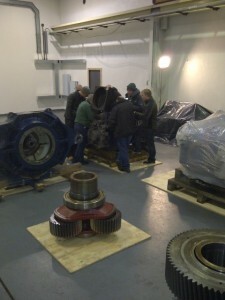 The recently held gearbox training course was deemed to be a great success by delegates and lecturers alike. “We believe the interest was strong enough to justify running another course 2013” commented Richard Hogg of PGC. The fact that the delegates were in a working environment for the practical part of the curriculum and were able to make actual inspections of damaged gearboxes was a great advantage. The new Moventas V47 gear fitted with the latest remote monitoring system CMaS was of interest to all as it demonstrated the ability to not only record vibration but also monitor the condition of the oil.